The 4th, revised edition of the Swahili Basic Course is founded on more than 40 years of experience which the authors have accumulated in teaching Swahili at universities and other teaching institutions. The course presents useful teaching material for universities and institutions which prepare for professional activities in eastern Africa. Furthermore, it is a suitable guide for self-instruction, since specialized knowledge is not required. 30 lessons supply the learner with a sound grammatical and lexical knowledge of the most important lingua franca of East Africa. The course is divided into the sections conversation, grammar, exercise, reading and vocabulary, thus combining theoretical foundation and practical language use. 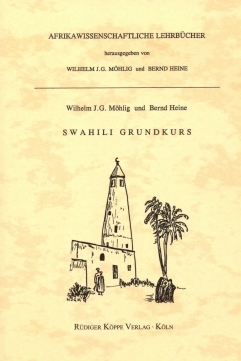 Additional exercises and language drills by the same authors are published in the Swahili Übungsbuch (see link below) which is also available for prompt delivery from our stock. Furthermore, the language drills and exercises can be obtained from us on a Audio-CD or on two tape cassettes (see links below), presented by East African mother-tongue speakers. Both textbooks, Grundkurs and Übungsbuch can be obtained at a discounted price together with the Audio-CD or with two tape cassettes (see links below).